Is passing Level II going to even help us in the job search? I’ve been searching for an asset management position for a year, and really haven’t been able to nail down anything. I did see a little bump after passing Level I, so is Level II going to help even more? Or does this test really just not help that much with the job search after all? It absolutely helps if you couple it with networking. Honestly, not really. I work at a large AM firm and we receive hundreds of applicants for every single opening. All of them are sitting for some level of the CFA exam. Many of them already have their charter. Sorry to say, but the CFA charter is no longer a differentiating characteristic, but more of a necessity or something that’s expected of someone in this industry. Having the charter will not necessarily open doors for you, but it will help in gaining credibility where it’s due in becoming respected. My advice to you is this: continue working on the exam, but focus on networking. Finding a job in AM is a lot more likely to come from a contact/someone you have a relationship with than just applying for random positions. Do you attend your local CFA events? If not, that’s a great place to start. Agreed. It won’t help much. I’ve had about 20 interviews since I passed L1 in 2008 and nothing has come from it. I don’t think Level II or the charter will change anything. MBA is your best bet for switching industries. The CFA candidacy is not a “cure-all”, “definitely lands you the job” deal. I look at it as a supplement that will give you the last final push over the edge into the job. This is assuming you have some education finance background and have shown you are taking initiative in the field. If all you have IS the CFA candidacy, then sorry, it’s not enough. You will be bitterly disappointed thinking just passing these exams and having nothing else will get you to a big investment bank’s fast. 2. The Final round process, where there’s a dozen people about equal, and you passed L2, which will make you stand out against the other finalists. Daviskr…I am curious as to how you found the exam the second time around? BTW, what happened to PTC? lol, do you really ever know?! I made a list of the all the questions I remember that I know I got wrong for sure and it’s not looking good. So I’m probably borderline at best. Hopefully it’s a high passrate this year. A lot of the stuff I focused on wasn’t in the exam. As compared to last year’s exam, I found 2010 way more quantitative. I structured my studying to really focus on the concepts b/c I felt I had memorized too much info last year as opposed to really understanding it fully. I felt super confident walking in due to the sheer amount of hours I’d studied, but that changed after the A.M. session. I thought it was nothing like last year and nothing like any of the mocks I had taken. Figured I’d pick up a lot of points on the conceptual info b/c without a doubt I knew it much better than the previous year. Well … that certainly wasn’t the case b/c it was formula after formula. Like I said above, I felt good about the afternoon session. One major difference between this year and last is I didn’t freeze up and forget any formulas. Last year I completely screwed up on things like the NOA/NOL section and levering a beta when I had it down cold during the weeks leading up to the exam. Mental fatigue is a killer with L2. I can honestly say that wasn’t a factor here. If I don’t pass AGAIN, there’s nothing I can change in terms of how I prepared. I understand this info inside and out. You just never know what to expect when it comes to exam day. 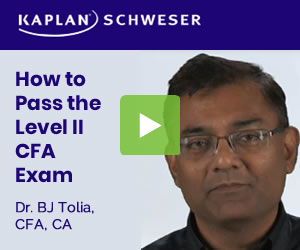 The CFAI can and will make any section of this exam as hard as they want it to be. Hopefully though, the stars will align for me with a pass. I’d just freak if I was a fail band 10 though. Can’t wait to get away from the multiple choice and on to the written exam. Plus L3 is right up my alley with all the PM subject matter. PTC got banned with everyone else. He did message me in FB the day of the exam, but I haven’t had the time to write him back yet. I’ll get to it tonight and see if I can get him back here on AF. Daviskr, great insight…thanks….I hope you pass…it sounds like you did fine. I think I memorized too much this year too, but I will probably give it another run next year and know the material that much better. PTC was a funny guy, maybe now with the back office he will be enticed to get back on here. Or maybe Chad just annoyed him to the point where he will never be back. Under the unlikely outcome that you don’t pass, are you going to take it again? Yes, sir. I’ve invested way too much time in this damn program over the past couple of years to just give up now. Plus those letters are a must for me. I’m realistic and understand it’s much more difficult for a woman to be respected in the AM world. Especially for a young, blonde one ;). The name of the game is all about gaining credibility. > give up now. Plus those letters are a must for me. > name of the game is all about gaining credibility. The CFA exams are such sausage fests. There must have been 5 girls for every 150 guys at my exam site. Why are there so few women in AM? I guess finance is one of those fields that predominently attracts more guys than girls. Thommo77, the exam in Montreal had several nice hotties. > attracts more guys than girls. …look at it as an opportunity, doesn’t matter why…that’s just the way it is. This is crap, and you kind of said the answer yourself. Finance is dominated by men, who do you think they will pick some hot blonde or a nerdy skinny white dude. I’ve lost out on 2 equity analyst roles to girls who I was better qualified than because they simply were girls with large chests. If you think you are at a disadvantage you’re on crack. Especially for a young, blonde one ;). so maybe there is a reason to use the “hook up” tab on AF afterall??? Yes, I feel that the CFA is going to help myself and others in the job search. But as other posters have mentioned, the charter is not going to sprout a set of legs and walk in a couple of your dream job offers to you; you still have to do the work of interviewing, networking, etc. I think my impression so far is that it helps more with showing what kind of person you are (self-starter, persistant, driven to take the limited free time you have and funnel it into improving yourself) than showing that you’re AMERICAS NEXT TOP ANALYST. You can pass all three levels of the charter and still obviously do sloppy work that adds little/no value. But it’s unlikely that you’ll pass all three levels if you’re not a committed and driven individual. It helps to stand out a bit, especially, if you’re a recent grad and applying for a junior position. It has zero value for more “seasoned” analysts. When you’re a grown up boy, it is your on the job trackrecord of success that really matters I guess. All of us should form a big network, we could easily leverage the size of this community for networking purposes. I wanted to have your opinion on something: do you think it is easy to switch from a Auditor position to an Analyst one after 1 year field experience and CFA Level 1 passed in 2009? I think that with the talent pool filled with CFA Charterholders, why would they want to hire a candidate? They can hire charterholders who are relatively the same age.